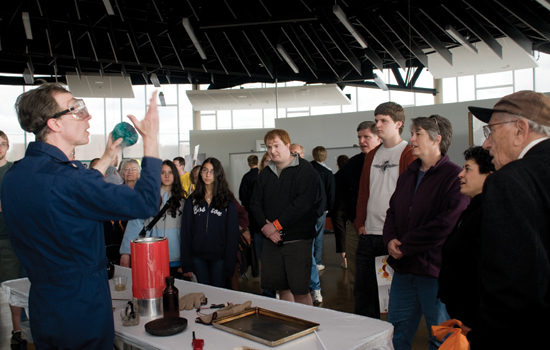 Mark Almekinder of Rochester Museum &amp; Science Center demonstrates an experiment using liquid nitrogen to lower the energy of air inside a balloon. The science center presented two exhibits in the new Center for Student Innovation during Imagine RIT: Innovation and Creativity Festival May 2. In form, the circular, glass-enclosed Center for Student Innovation is unlike any other building on the RIT campus. Its function is likewise unique. The 10,000-square-foot space is intended to serve as a multi-purpose hub where teams of students from all corners of the university can develop and showcase innovative and entrepreneurial projects. The RIT community and campus visitors got a peek inside on May 2 during the Imagine RIT: Innovation and Creativity Festival. Student entrepreneurs—most from the Simone Center for Entrepreneurship and RIT’s Venture Creations business incubator—set up exhibits spotlighting their business ventures. The center, which will be fully operational this fall, is a key in RIT’s endeavor to become the “innovation university,” says Ian Gatley, recently named director of the Student Innovation and Undergraduate Research Support. Gatley gave up his position as dean of the College of Science to take the new post. He believes there’s no job more important than guiding the launch of the new center. The Center for Student Innovation will serve many people and many functions, so the space needs to remain very flexible. Industrial design graduate students were invited to develop ideas for furnishing the space and their models were on display during Imagine RIT. One of the ideas under development are two-way “video portals” that will connect the center with labs and facilities all over campus, says Jon Schull, associate professor, interactive games and media. “There’s going to be a holodeck aspect to this,” says Schull, co-chair of the Innovation Curricula Working Group. The glass-enclosed Center for Student Innovation is part of a $15.6 million, 54,000-square-foot complex that also incorporates the three-story University Services Center. That building will provide office space for a number of RIT departments, including Development, Government and Community Relations, dean of Graduate Studies, Student Employment and Sponsored Research. On the first floor, the Student Services Lobby will serve as a location where students can manage business related to finances, scheduling, parking and housing. People will begin moving into the space in the next few weeks. A formal dedication of the building will take place in the fall.